Maria Domenica lived a normal, peaceful childhood for her time and she graduated from the local village school. In her early teens, she devoted herself to work, prayer and helping the suffering, especially those affected by the epidemics that raged in that area in the 1820’s, and she helped her neighbors and those in nearby communities, especially in caring for the little children. During that period, she had a love for reading the lives of saints, most notably the writings of St Alphonsus Maria de Liguori and especially the accounts of the Passion and death of Jesus, in which she showed a marked preference. In 1829, her father Bartolo dies of pneumonia. Maria Domenica was only thirteen. While it is normal for a child to suffer due to the loss of her father, but for Domenica the loss of her dad is something more: it marks the beginning of her incredible mystical journey. Since that fateful day, her health begins to deteriorate slowly. She is seized more and more by mysterious physical illnesses that are unexplainable, that slowly seem to weaken her. She also enters upon a more intense spiritual life. For over a year, when she was between the ages of 17 and 18 years, the entire region was infected by an influenza epidemic “the grippe". During this time, she spent countless hours helping with the care of those in nearby families. On August 15, 1833 (the feast of the Assumption of Mary) there began what Dr. Leonardo Cloch defined as “the long, painful illness of Maria Domenica Lazzeri.” It began with her staying in bed with what was believed to be the flu, along with her mother, but unlike the latter who would resume her normal activities within a week, Domenica was to remain bedridden for the rest of her life-from age 19 to 33- 14 years total- until her holy death in April, 1848. The news of this extraordinary young woman who bears the wounds of Our Lord makes the rounds of the houses of Capriana and the surrounding countryside and soon arrives at Trento. Bishop Blessed Giovanni de Nepomuceno Tschiderer (died † 1860, and has been declared Blessed –editor) orders an investigation ex officio. Such extraordinary mystical graces were not new to this holy Bishop, as already two other women in his diocese are subject to mystical-physical phenomena: Maria von Moerl and Crescenzia Nierklutsch . Domenica also had the gift of bilocation which was mentioned in the letters of Blessed John De Nepomuceno Tschiderer, the Bishop of Trento, in which the girl had completely disappeared more than once from her bed to find herself in Caldaro or Tscherms to pray in union with two other stigmatized women who were her contemporaries. Eventually, because of the throngs of people who were coming from all over to visit her, this holy Bishop was obligated to implement strict measures of access to the house by visitors, which was gladly appreciated by "Meneghina", who was unable to bear so many visits, and was in danger of losing the calm necessary for meditation, reflection and prayer. This same holy bishop cautiously and prudently avoided going to visit her personally, but in private and in writing followed her closely in her ordeals, and expressing respect and admiration he did not hesitate in time to take his defense against the false reports and rumors that were circulating in the British press. 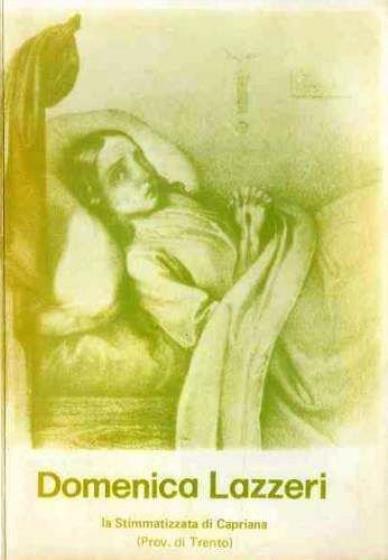 One source also gave a quote from Dr. Leonardo Cloch that stated that Domenica herself did not require washing, and despite her stigmata and scourging wounds bleeding profusely, afterwards her clothes and sheets were always to be found to be white and clean. The author of these lines was unable to verify these particular statements. The first official act for her cause was in 1943 followed by the official exhumation and recognition of the body in August, 1944, but the cause was then postponed because of the terrible events of World War II. Following fifty years of neglect and silence, the cause was taken up again in the early 1990's and on April 4, 1995 the Archbishop of Trento, Giovanni Maria Sartorio, celebrated in the Church the opening of the process of beatification of the Servant of God, Maria Domenica Lazzeri. Following a successful progression in the local Diocese of Trento, the cause moved to Rome to the responsible Vatican congregation in 2000. 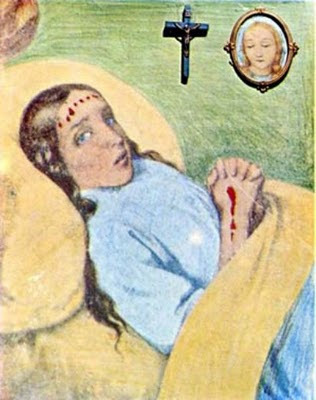 There are no pictures of her, but only an early portrait that depicts her in bed with the stigmata visible and her hands grouped and joined together, as if by nails. 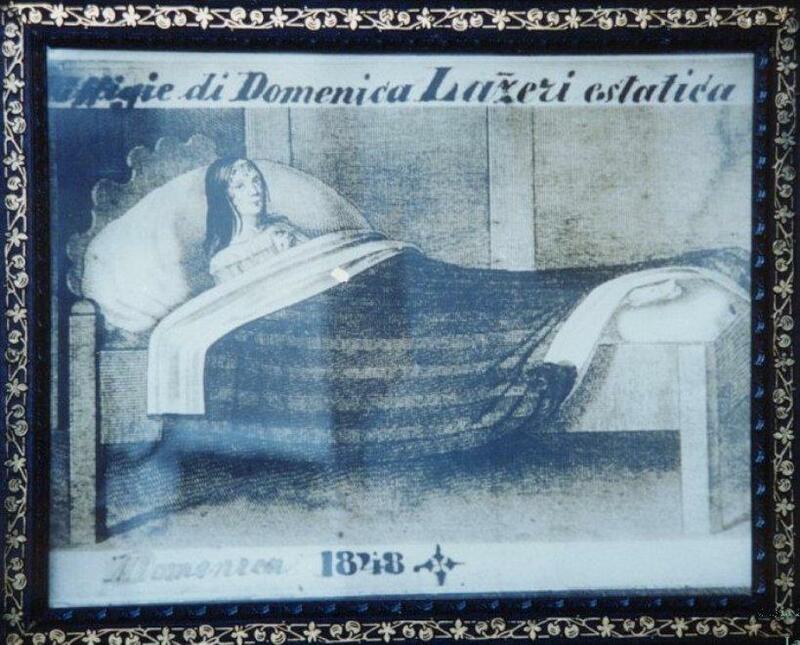 Servant of God Domenica Lazzeri, pray for us! I was happy to read more about my ancestor. Iam from the Lazzeri family who was from Capriana and Trento. I do have the card with Domenica's portrait. My great-grandmother was Melania Lazzeri. In my blog posts I often tell people that there are people who share in Christ's passion so as to atone for sins and intercede for the salvation of sinners. The passage quoted above caught my eye for that reason. I do not know any personally nor do I know how many there are, but I am aware there are some who share the passion and we should devote ourselves to virtue instead of sin so as to lighten their load. April 6th is believed to be the date of the resurrection. If that date is correct then this holy woman died on the date of the original Good Friday. Very interesting observation! In fact, a friend and I are just finishing up a website entitled "An early Christian perspective on the Mysteries of the Rosary", and one of the important points brought out is that there is very strong evidence showing that Jesus died on April 3, 33AD. If such is the case, then as you point out the date of Domenica's death would be quite notable and interesting, I think. Those interested can view the article concerning the date of Jesus death here. Thanks Glenn for another interesting article. There's nothing better than a cup of coffee and your website on a Saturday morning. Thanks for the nice comment! I am really glad to hear that you are enjoying the website.